Fans of Alden Richards and Maine "Yaya Dub" Mendoza (AlDub) bashed Lea Salonga after the singer-actress tweeted about kababawan (shallowness). Ang daming judgmental at defensive dito. Haaaaay, di niyo na-gets ang tweet ko. The former Miss Saigon star did not mention anything in particular, but some netizens speculated that she was referring to AlDub fans which sparked an outrage online. AlDub fans argued that the segment featuring the phenomenal love team entertains them and promotes good moral values for the youth. Lea explained later that she was not hitting the famous pair at all. For those of you that replied about BALANCE, you rock my world. That's what I was after. We all need fun, but that can't be all there is. Gusto ko sanang isipin na malinaw na ang aking pagpapaliwanag. 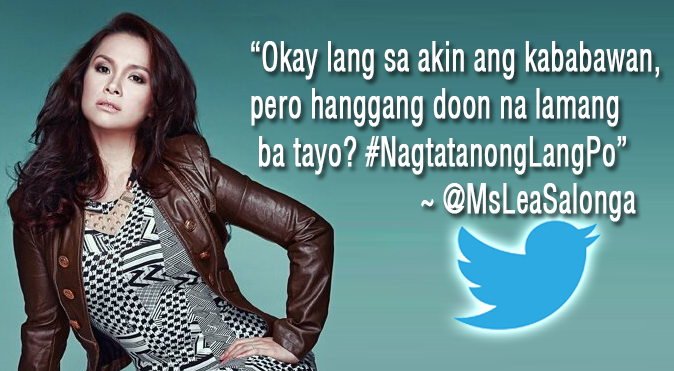 AlDub fans, however, continued to post negative comments against Lea so she decided to clarify her tweet. Uhmmm... I have no idea what's going on. Why did people assume I was tweeting about AlDub? I wasn't. I don't know about it. So why the hate? Only now am I finding out that today was a significant day. I honestly had zero idea anything was going on! My tweet was pure coincidence! So stop the hatred, the negative assumptions, whatever you're throwing at me. Just send me links so I know what the fuss is about. In a response to a comment, the 'Voice' coach appreciated Yaya Dub, saying she is gorgeous. @galeanthropic @richeldulce Oh my. That girl is gorgeous.